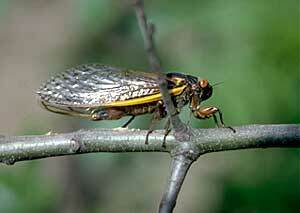 This specific cicada species appears every 17 years as an adult. 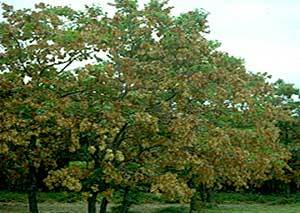 Adult females lay eggs in the 2-3 year old stems of deciduous woody plants, especially oaks. It is this extensive oviposition that kills the shoots. 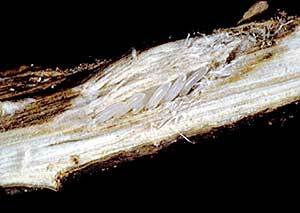 It has long been believed that this is the only injury caused by these insects but in recent years there is evidence that the immatures in the soil may cause injury to landscape trees growing on stressful sites, such as in compacted soils. Egg-laying may kill many 2-3 year old shoots but, given a 17 year appearance cycle, this should not cause long term injury. However, previously stressed or very young trees may be severely injured or killed. Adults are about 1 1/2" in length and are the largest of the homoptera in the Northeast. In mid-late June, adult females insert their long and sharp ovipositors deep in the 2-3 year old shoots of the host tree and lay 8-10 eggs, They continue to move down the stem repeating this process many more times. These eggs hatch in August and the newly emerged nymphs drop to the soil and burrow in to the root zone of the tree where they will feed on roots for the next 17 years. In the early spring (April) of the emergence year, the nearly mature nymphs will tunnel to the soil surface once the soil has thawed and warmed. Then they will go back down about a foot for another month. 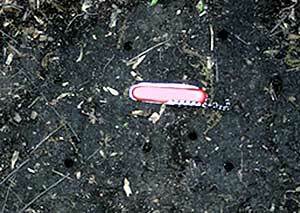 The purpose of tunneling to the surface in April is to construct an emergence hole while the soil is still moist. In early June, the nymphs will emerge, in large numbers, and crawl up onto any available surface that includes plant material and buildings. There, they will molt into the adult stage. During sunny days, the large number of males can be heard "singing" to attract a mate. This collective sound is perceived as a loud ringing noise to the human ear. 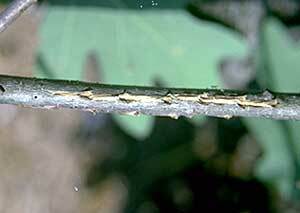 After mating, the females then lay their eggs in the stems of deciduous plants. They will not be seen again, as adults, for the next 17 years. 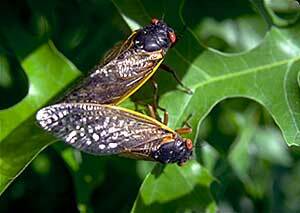 Similar species are known as Dog Day Cicadas and take 2-5 years to reach maturation. 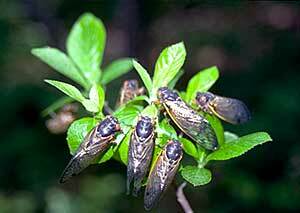 These are seen (or heard as a loud buzz in the treetops) every summer on hot days, to a limited extent. 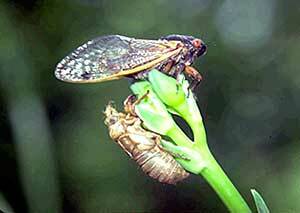 Cicadas and their host plants have been co-evolving for over a million years and their attack on the host every 17 years may appear severe, at the time of attack, but in reality it is only a "natural" pruning. 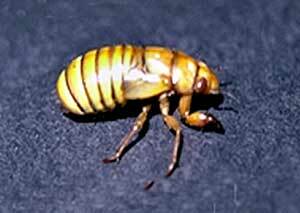 As long as the host is healthy, these insects should have no detrimental effect on them. However, weak trees, young trees, or new transplants should be protected from oviposition. Small trees can be covered with a fine mesh material that precludes entrance by the females. Otherwise, a chemical pesticide may be required.